The WMH Laboratory serves our community's physicians and health care providers through a wide variety of diagnostic testing services. With state of the art technology and certified and experienced staff, the laboratory provides testing services for routine and emergency situations. Nearly all of the testing is performed right here and includes blood bank transfusion services, diagnostic pathology, microbiology, general lab, and occupational drug and alcohol testing for community businesses. It's clear to see that War Memorial Hospital's Laboratory staff cares about quality, our patients, and strives to show that through every test by providing accurate and fast responses. The WMH Laboratory is full-service and operates continuously to serve patients in the hospital. The out-patient hours of operation are Monday through Friday, 6:30 a.m. to 6 p.m. and Saturday 8 a.m. to Noon. For a complete list of satellite lab draw stations, see below. 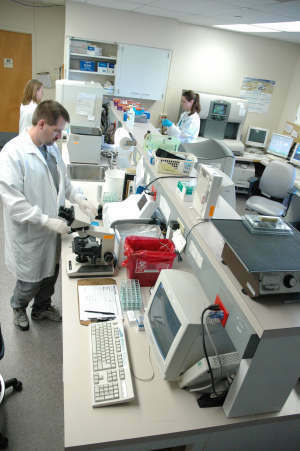 Through the Laboratory, WMH also provides Federal and non-Federal drug and alcohol testing including collections of urine drugs, breath alcohol, and hair analysis. Federal and Drug-Free Workplace model programs available through a partnership with a third-party administrator. DATIA member since 1998. Office hours are Monday through Friday 8 a.m. to 4:30 p.m. Appointments preferred but walk-ins are welcome. There is also 24-hour, 7-day a week coverage for post-accident and Reasonable Suspicion testing. For more information, please call (906) 635-4353 or email: wmhdat@wmhos.org.